She’s not going to law school. In a new interview with “Vogue“, Kim says she’s doing it through California’s “reading the law” program, where you study on your own and work with a practicing attorney. She’s doing a four-year apprenticeship with a firm in San Francisco, and she plans to take the bar exam in 2022. Helping PRESIDENT TRUMP with prison reform was the turning point for Kim, but she says her interest in law goes back to seeing her dad, Robert Kardashian, work on the O.J. Simpson case. VAN JONES from CNN has been working on prison reform with Kim, and he gives her MASSIVE credit for being able to get Trump on board. And he says she’s not what most people think she is. @KimKardashian is used to being underestimated. If the media mogul/beauty entrepreneur/soon-to-be mother of four’s next act—studying law—seems unlikely, perhaps it shouldn’t. “This is the daughter of an accomplished attorney and the mother of three black kids who is using her full power to make a difference on a tough issue and is shockingly good at it,” says @CNN commentator and activist @vanjones68. Jones brings up the Elle Woods character from @legallyblondemovies as perhaps the only archetype we have in the culture through which to understand such an unlikely turn of events. “But she’s so much deeper than that,” he says, “because the gravity of the issues she’s taking on is so tragic and all-pervasive. I think she’s going to be a singular person in American life.” In many demonstrable ways—for better or worse—@KimKardashian already is. But if she were to pass the bar, it would be the most surprising rebranding since @Barbie got woke, a case to be studied at @harvardhbs for years to come. (Indeed, she has been invited to speak at Harvard later this year “on branding and media.”) “I love to be put in a situation where I can have a conversation with someone who might not be inclined to think much of me, because I can guarantee they will have a different opinion and understand what’s important to me after they’ve met me,” @KimKardashian says. Tap the link in our bio to read the full May cover story. Photographed by @mikaeljansson, styled by @tonnegood, written by @jonathanvanmeter, Vogue, May 2019. @kimkardashian’s sprawling family home in Hidden Hills, California is a cathedral of warm, Belgian minimalism, designed by @axelvervoordt. Enormous is the coin of the realm here, everything designed on the scale of more. There is a staff kitchen—where the family inevitably winds up spending most of their time together—and a show kitchen, with an island as big as a dance floor and a breakfast nook that comfortably seats 20. It is an astonishment of clean, clear surfaces, nary a pot nor pan in sight. There is a grand center hall, and because the floors, walls, and ceilings are finished in the same color and texture (a kind of bone plaster), it messes with your perspective, like you might just have to walk all the way to infinity. @kimkardashian’s bedroom is the size of an airplane hangar. The adjoining bathroom offers a shower big enough for a basketball team and a wall of glass that looks out into a kind of junglescape—you half expect an orca to swim up to the glass. In a house that is nearly devoid of stuff, at long last we come upon something that sparks . . . not joy exactly: a pile of big, fat books—on tort law. 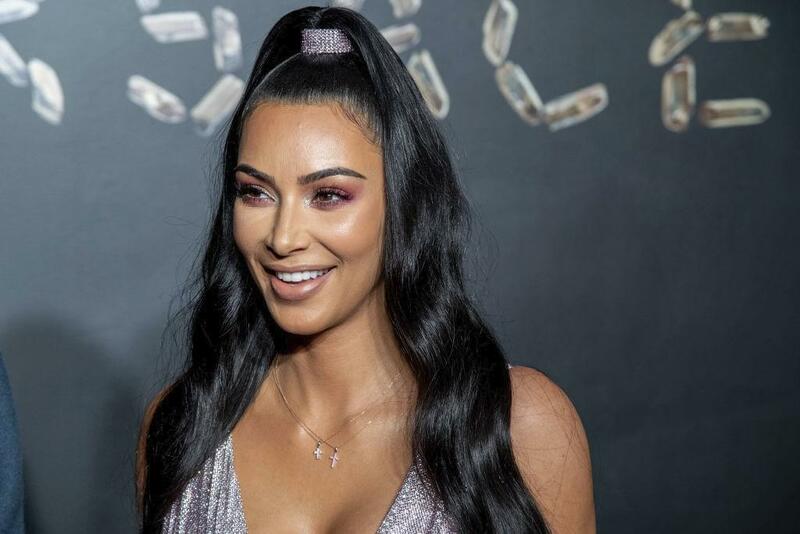 Just when you think you’ve kinda sorta maybe figured out who this unusual creature is, think again: Kim Kardashian West is studying to become a lawyer. Tap the link in our bio to read the full interview. Photographed by @mikaeljansson, styled by @tonnegood, written by @jonathanvanmeter, Vogue, May 2019.